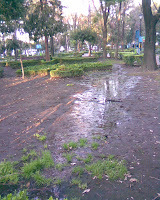 My girlfriend and I were walking past Parque de los Venados yesterday, and saw the park being flooded to water the plants. However, there was no-one in sight to turn off the hosepipes. Since there appear to be stories in the news all the time about the scarcity of water in Mexico City, why are the parks wasting so much water?